Since the early 1990s Bridget Smith has made groups of photographs of certain kinds of self-contained spaces, such as a football pitch, a sound recording studio, a boxing ring, hobbyists' clubs and societies, themed hotel bedrooms and locations in and around the city of Las Vegas. All of her choices of subject provide her with different types of stage, which are all places in which scenarios are enacted. One key characteristic of these images is that although there might be evidence of human activity, all of these photographs are devoid of human presence. They resonate stillness and intimacy, both emphasising and wrong-footing the nature of their own construction as photographic veracity, and producing a heightened sense of their particular mediated reality. These worlds within worlds are in fact, a kind of metafiction. For her exhibition at PEER, Smith will exhibit five photographs and a 12-minute film portrait that were produced in Tokomaru Bay, a small town on the remote eastern cape of the North Island of New Zealand. 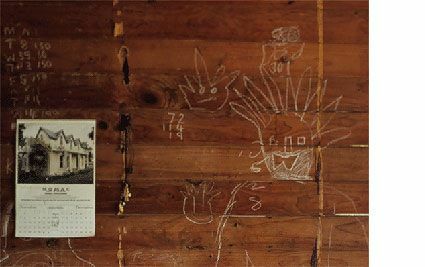 Departing from the un-peopled spaces of her still photography, the film focuses on the story of Mark, a man whose younger life as a possum trapper was shaped by his relationship to his working environment of the dense, almost impenetrable landscape of North Island. Now living in a small isolated cabin, Mark vividly recounts his earlier days of life in the bush. Speaking as if these events took place only yesterday rather than (the actual) 30 years ago, we are aware that Mark's past life is fed by memories which are perhaps more sustaining than his current everyday reality. Two of the photographs in the exhibition are of Mark's cabin, a space inhabited solely by him, though it is clear in the film that its previous tenants included children, as revealed both by the abandoned slide outside and by the naà ¯ve and affectionate drawings scratched onto the wood panels of the cabin's interior. This sense of impermanence, the makeshift nature of Mark's domestic environment, is also evident in the other photographs displayed at Peer. The home of a local photographer, the collectively used spaces of the town's Whangerie Stationary Engine Club and crayfish catchers' hangout are work spaces, lunch rooms, tool-sheds and club houses collapsed into one  cluttered and ordered in equal measure. These images are without the symmetry and calm of Smith's investigations of the meeting places of London's different societies and groups where a sense of history and legacy permeate. Their temporary appearance belies the fact that these are places of both informal and serious activity  living and working environments in the continual process of change. FREE PUBLICATION: A 16-page booklet with an essay by Richard Grayson plus images of all of the work exhibited including film stills will be available during the exhibition. FREE ARTIST'S GALLERY TALK: On Wednesday 23 June at 6.30, Bridget Smith will be in conversation with curator and writer Sacha Craddock. Spaces are limited so please arrive by 6.15 to guarantee a place.